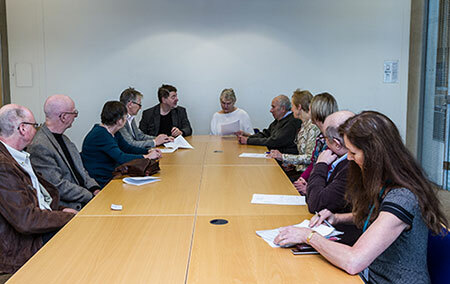 The Nottingham Stroke Research Partnership Group (@astroke) is a group of stroke survivors and carers who work with stroke researchers from the University of Nottingham. The Group meets every two months to review stroke research proposals. Where appropriate, lay members may also serve on research study steering groups or participate in research studies themselves. The Group’s aim is to ensure stroke research conducted locally involves stroke patients and carers and is informed by their needs and wishes. You will be asked questions on the day. There is usually a 15 minute Q&A session allowing input from lay members (stroke survivors and carers). You will receive feedback after the meeting. You will be expected to provide a status update, including whether funded or not, to the Group six months after presenting your proposal. The Group is currently composed of 15 stroke survivors and carers who meet every two months. We also have 17 virtual group members who review research proposals and provide comments electronically. The Nottingham Stroke Research Partnership Group (atastroke) held a Stroke Research Workshop in 2018. This was attended by over 60 delegates most of which were stroke survivors, carers and families affected by stroke. Back by popular demand, the Nottingham Stroke Research Partnership Group is hosting another Stroke Research Workshop event on 23rd July 2019. This free event is open to stroke survivors and family members. Places must be booked in advance. Have you had a stroke? Do you care for a stroke survivor? in shaping future research directions. Tell us your priorities, so that future research will produce better outcomes and experiences for people like you. This is a free event. Lunch and refreshments are provided.